I love my job is a phrase you commonly hear from Maryam Rahman, MD, and she truly means it. Driven by her research and the exciting results it has produced, Dr. Rahman’s passion is easily seen and felt by her colleagues and patients. While she cannot imagine herself doing anything else now, she did not enter medical school with the intention of specializing in neurosurgery. She enjoyed her classes in the subject and some of the initial research, but it was not until her rotation in neurosurgery that she found her calling. “When I rotated through neurosurgery, the most enamoring part of it was the patient population for me,” Rahman says. The special relationship formed with patients and the immense impact she could have on their lives drove her to a career in neurosurgery. While this career has its challenges, Dr. Rahman considers it an honor to go through the treatment process with her patients and their families. Dr. Rahman is currently working on several treatment platforms to improve immunotherapy response of individuals with malignant brain tumors. 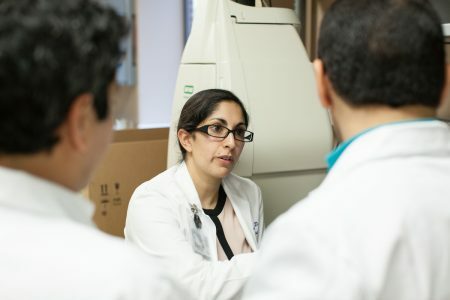 In addition, she is working on novel therapies using vaccines that aim to track the vaccinated cells in a patient’s body to their lymph nodes or brain tumors using new magnetic resonance imaging, or MRI, techniques. Immune checkpoint blockers, a novel drug treatment, is a large part of her research. She is conducting numerous experiments to find out how these new drugs can be combined with current chemotherapy drugs to treat and cure tumors. Through her research and patient care experience, Dr. Rahman learns lessons and gives deep thought and consideration when developing a treatment plan for her patients. Her clinical work in the operating room and her research in the laboratory and in the clinic are focused on ensuring the best possible outcomes for her patients. Dr. Rahman grew up in Panama City, Florida, and even though she used to be a Florida State Seminole fan, she is now a dedicated University of Florida Gator. She enjoys outdoor activities here in Gainesville, including the state parks, and she frequents the local restaurants. She is lighthearted and has a great sense of humor. She says if Hollywood made a film about her life, it would be a comedy called Theatre of the Absurd with the lead role played by Aziz Ansari or Mindy Kaling. Dr. Rahman constantly reminds herself of pieces of wisdom her parents gave her growing up. They taught her that good things do not come easy and that hard work is the key to success. She also learned to not give up when something appears challenging, and this perseverance has served her well as a neurosurgeon and scientist. She believes that challenges are disguised opportunities. Dr. Rahman is passionate about being a partner in her patients’ journeys. “There is no greater honor than leaving the operating room and telling my patient’s family that surgery went well. Their loved one is safe, and they will have an improved quality of life going forward,” she says.